A Submersible: Hi Min, I'm really pleased you'd like to do an interview. So as you suggested I'll start off with a few initial thoughts about your work. In your Sea Close by IV, I was interested in the dense wall of pencil marks and what kind of experience you were interested in there. Works of this kind perhaps have an atmosphere to them. So the pencil marks affect you directly rather than via depiction. So I wondered about ideas of immediacy and atmosphere in relation to your work. 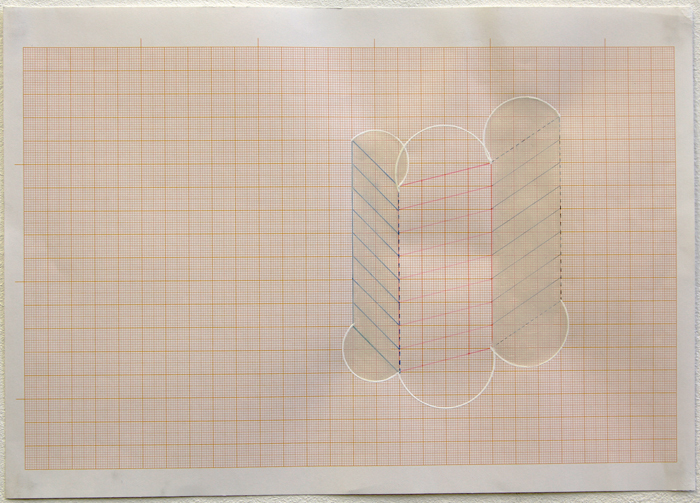 In your a drawing for a blind I like the incorporation of non-visual experience into the work. Again I suppose it maybe ties in to immediacy in art. I was also curious about your waiting piece. For me at least, the repetitive aspect made it more about process. The focus seemed to sit with the idea of "process" thought of in a spatial sense given the way the sheets are shown in a stack and then after they've expanded out to fill the space. For me this resonated with thinking about the relationship between our thoughts and the space we inhabit. I really liked your piece, pillow. I think you've set up a fascinating play between a concept and its manifestation. There's something exciting about how each piece is pillow-like but it's not just a series of pillow photographs for instance. So whenever you try to relate each one back to the common concept of a pillow, it's always awkward because of the material particularities of each piece. So there's this awkwardness in trying to conceptualise what you've made. It reminds be of our occasional experience of the world just seeming beyond language. I think the awkwardness of the piece is enhanced by the layering/blurring; it's hard to isolate the different elements. I hope this helps a bit. Please let me know if you have any more questions I can answer. In the meantime perhaps if I could start by asking if you see any particular themes or characteristics that unite your work? Min Kim: Hi Nick, first of all, thank you taking time to see my work and write your thoughts. I do not have a main theme or medium that unites all of my works. I choose a particular medium (drawing, writing, media, presenting objects, sound, etc..) according to how to speak. I think of medium as a tone of voice, so in the result, each of my works has a different medium. So, it is very hard to say what I am doing it and how I am doing it. The ideas for work come from my personal stories, so they always change as I am living my life. I see my work as "self-notes". I think the reason why you couldn't really say what you want to ask at the start is not your lack of knowledge. I am aware that my work, at first, can be pretty hard to connect with or see as a whole. I feel the same as you in that I am not quite sure how to summarize my work. And yet, these uncertainties are what I enjoy in doing work. A S: Could you talk about how you understand material in relation to your work? M K: As I get on working, my ideas, material and medium interact in lots of ways. I think of all materials as allegories that my ideas could translate into. What I really enjoy is finding or exploring the material. Then if ever I find some interesting object which includes even actions, sounds, something invisible, then the material itself speaks to me. So I could get ideas from the material. I think all artists work like this. The character and nature of material that I am working with teaches me a lot. It is all about questioning and answering. Learning and studying the nature of materials is at the heart of my practice. For example, take my use of candyfloss in the weakest home. I found the relationship with people so weak, fragile and even to be nothing. Before I felt that the relationship with my people seemed so strong, there was something between me and people, so that I believed in it. Then suddenly I realised that the relationship I had built so elaborately had just gone even without saying goodbye or anything, there was just nothing, even less than nothing... I wanted to find something....the weakest material. I started with air, powder, soap, ice snow...which all evaporate very easily...then I came across candyfloss. Candyfloss is tangible, visible, and solid but actually it is mostly nothing. It looks sweet, basically candyfloss is understood as a happy thing, but also something that disappears easily. 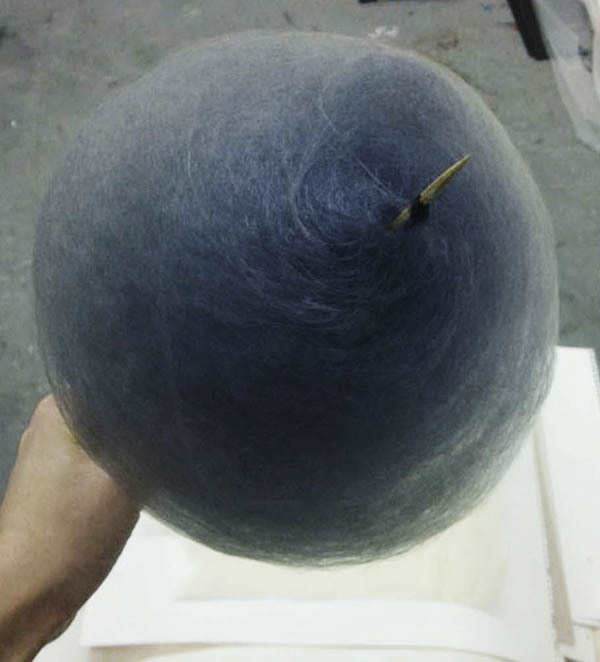 So I made candyfloss with black food dye in order to make my work questionable, it was just after I made the papersoap work which has the same idea. The candy floss study made me realise that the material itself would last forever, but that it was the conditions of keeping candy floss that was the matter. I could relate it to the matter of relationships with people. I intended to make something absurd (like black candyfloss or a strangely huge ear of an elephant) to invite people in. I try to keep a metaphoric and poetic aspect in my work. A S: Could you talk a little bit about your guest piece? I mean it has things in common with the weakest home given that it is made from a material which is close to nothing. M K: Yes but I think it would be good if you had a piece of paper soap so you could experience it while I am answering your question? Again, it's an experimental work and I always prefer people to meet my work first and then my words. This is especially so with guest. If you give me your address than I could send it to you tomorrow by post? A S: Thanks for sending me your paper soap work. So what were you interested in when you were working with this material? M K: I think I was lost in between the visible world and the invisible world, (it's almost five years ago now actually). I could see the world as quite superficial. We show less respect to the unspoken, invisible, small and weak things. Because at first sight they look trivial. The louder voice almost always wins even if it's wrong. I felt the world tended to pursue something strong and pretentious, that power was more important than truth? What is fragile and hard to be seen is often neglected. But I thought that what really existed in our lives, what was at the core of it, was actually invisible. That's what I couldn't really put any words to, I mean in a linguistic way. I think I had trouble where I couldn't express myself, so that I was often misread and suffered from it. From there, I was dreaming that I wish people had seen how my true mind worked. And yet, on the other hand, I found we didn't see something even though it was very clearly visible. It's an inconsistency I think in how we live our lives. I talked about two opposite places, one visible, the other invisible. I was curious if I could draw intangible things in an intangible place. Like imagination in one's mind. I offer actual material, soap and text, and dream of an invisible world with them. I intended to set the papersoap with text in a public toilet so people would meet them unexpectedly instead of the normal soap. People are supposed to wash their hands and might read the texts. The texts have a very unusual sense, they are very absurd and strange. As people are washing their hands, the tangible and visible object, the paper soap is disappearing for good. The text on the paper soap is gone too. I expect some people may continue to think about those texts in their mind invisibly. Washing your hands would be maximum 1 or 2 minutes but what about afterwards? This work focuses on this moment of shift and how it lasts. I have to say that this work is still in progress even though it was born many years ago, because it hasn't been opened in public and I think it hasn't arrived at the best condition. I think I could work on this more. And yet this work has given me so many other ideas. I could not have made the weakest home and homeless without its materiality and poetic ideas. A S: I like the idea of placing them in public toilets. Our hygiene rituals don’t require much thought and so are often moments for reflection, but because they happen privately it’s different than in an art gallery, more personal and genuine maybe? After reading what you’d said, thinking about intangibility, I’d kind of imagined it would disappear instantly in my hands, almost like a puff of smoke. But then of course it turns soapy before. So I just thought it was quite strange that there’s this kind of mini upsurge of the material before the disappearance. And the way you’ve got to keep rubbing your hands to get rid of it, almost quite aggressive given the context you set up for it.....I’m not sure what you think of that? M K: It was interesting to read what you said about having to be aggressive. I always think the paper soap work is very fragile and I give extra care to treat them carefully and keep them. That work is like my 'weakest child' within my work in my mind. I would be happy with the aggressiveness that occurs in the work unless it destroys the main concept which is playing between the invisible mind and physical materiality of the paper soap work. If technically that is a disturbance then it needs to be changed. I am already aware that it needs more rubbing of the hands than usual hand washes, so it takes people a bit longer. I would not change the material for my concept though. The main action 'cleaning', which was given by choosing paper soap for the idea of 'disappearing', suits my concept pretty well, both technically and metaphorically. It's just it shouldn't irritate people in getting rid of it from their hands, as that would kill my main interest..
A S: Would you also be able to tell me a little but about Hi Borges? So about Hi Borges: It was almost the end of my seeking the weakest material as an allegory of our relationships. At the same time, I was trying to draw the library of babel, which is one chapter of the book Fiction by Jorge Luis Borges. I was trying to draw it almost everyday. I spent 3 times longer in hesitation than actually moving my hands on the paper. The library of babel has only 9 pages, conceiving of a universe in the form of a vast library containing all possible 410 page books of a certain format. Borges's narrator describes how his universe consists of an enormous expanse of interlocking hexagonal rooms, each of which contains the bare necessities for human survival, and four walls of bookshelves. It would be good if you read the text briefly (I will attach it). As you see, the text is very descriptive in a visual way but then again, I couldn't quite understand the structure of library in my head for the first time. So naturally I wanted to draw a pictorial map of this library. Following his guidance, step by step, I made walls, located and divided the rooms and opened the main entrance and then hung the mirror there. There was a spiral staircase facing to the mirror, and I let a staircase be infinite. Although I followed every single sentence sincerely, I couldn't complete the map when the text was finished. I was lost even though I followed the signs. Moreover, I couldn't even get back to where I started. The next day, I drew it again from the beginning. I followed his sentences more meticulously. I got a ruler and a pair of compasses, my drawing was getting more delicate, my heart was even beating. I was a bit nervous but also excited that I thought I would be able to complete the drawing of the library this time. But it was really weird that I was building a completely different structure from the previous drawing I made. I asked myself, "were you half asleep drawing the library yesterday?". The story was finished, and...I got lost again, even though I turned around and looked back at my drawing and the text. I hated Borges. After failing a few times, I tried harder out of spite. I glued the drawings to the wall, I started again. Then after just a few minutes, I crushed a piece of paper and dumped it, I wanted to ask Borges to explain again, I was in panic. Then I thought, maybe it came from the matter of translation, that might disturb my way. I read it in english again, but no, failure again. Then I realised (or just compromised myself) that this was not a failure, it was just that he actually designed it like that, to be able to be drawn in an infinite number of ways. Suddenly, I'd got fascinated again, all different drawings delivered from only one standard, it aroused my curiosity. I could see this was the matter of how I perceive things from their standard. One text invites me to so many different spaces and ways of understanding. There is no final answer but there is a positioning. The standard is changing, moving and diverse depending on where I am, how I reach! This allowed me to stop comparing unmeasurable things since from trying to draw the library of babel I'd realised that 'positioning' was the matter. It's about the value and is very personal. I have invited people to join me drawing the library too. Also with more than one language for one person, translation is, I think, also a part of positioning in this sense. I could see that people build their own libraries differently, their own universes from the text. As the standard became flexible as I changed my positions, I feel I am much freer, I came to understand more about, I dare say 'life'. I do not think I drew all those different drawings of the library of babel considering it as an art piece, even though I enjoyed playing aesthetically in drawing. However I do really like the fact that doing those drawings gave me an understanding of my questions, sometimes as an answer but sometimes making another question to my questions so that my questions have been changed. I learned something through doing those drawings. This is the real reason why I make work. I think the word interests me more than anything else. For me, the ambiguity of text makes me imagine and I always get new ideas rather than the ambiguity of visual arts. The imagination from texts is almost infinite. Borges is one of my favourite writers. I feel as if I get lost in a maze in his texts. I enjoy his imaginative writing breaking my limits of creativity. I have not been able to give myself the space to draw the library of babel for a long while as my circumstances have been pretty harsh. My drawing of library has been a long journey being through several architectures and objects. My last drawing has a boat on the sea. I understood the library of babel as a boat which has a transformable sail and the sea as a mirror. I am still fascinated to work on it and I am thinking of shifting it to make it in three dimensions. If you are interested, you are very welcome to join to build your library of babel. One thing occurred in my mind that the work of the artists on your website showed me a kind of certain taste of your art appreciation, but I couldn't really find my work around them that my work seems pretty different and I am curious how you got my work? A S: Yes well I think I'm just exploring art at the moment so don't really see myself as having a taste yet. I just get in touch with artists whose work I find interesting somehow, perhaps work that also confuses me a little at first too as that makes me more curious. Could we talk about your Swiss residency last year? M K: Yes, for that I made four bodies of work. First, I made (writing, photography, sound and material) a book about the elephant. A year and half of my practice on the elephant gave me such a huge lesson as an allegory about not only being 'massive' but also being unusual, being out of the frame. I wanted to weave in the whole journey and its presence. The end of January last year I donated my elephant drawings to Amsterdam Zoo. I delivered the 3m long tube by myself from London to Amsterdam on foot, train and ferry over night. I thought having a 3m long tube in public space would not be easy, rather often unpleasant and many problems would be encountered. I had to chose further and remote paths rather than faster and cheaper ways. During the delivery, I had basically two different reactions from people and public facilities: One was help and the other was inhospitality. Since then, I have been really immersed in the idea of 'help' and it became the idea of 'two'. One and the other, 'I' myself and the others, the world, including another myself. I made a couple of works with the idea based on 'two', a circle and circulation, a matador and a broken mannequin, two swings and also one with knots. In one pice I worked on, there are two swings facing each other and their ropes are connected. So one swing isn't able to swing (float) if the other is empty. There must be 'the other' supporting with its weight. Also when two swings play, their weight decides the length of rope, this length of rope being the radius of the circle of their movement. All are connected. I think it could examine some types of our relationships. If you see the video document of the preparatory work I did for my swing work two, there were two swings are confronting, moving toward each other and getting away, then at some point they are moving in the same direction, forward and backward together, keeping the same distance. Then later, one may stop before the other. One may have a more active movement but the other may have only very weak movement. There are so many variations that could possibly occur. Ambivalent ideas are inherent in the swing work. Physical and mental, material and immaterial, tangible and intangible...I simply denied immateriality after a study on unsubstantial matters. Maybe it was inevitable to turn into a study on physicality. Or I got exhausted. And then, one’s will comes in. Immateriality in and beyond materiality. What interrupts the operation of the swings is only two persons’ own volition. Will to continue to swing, will to keep a certain distance between two, or to get closer or further away, even if one stays suspended in order to bring into existence, like syncope of the movements...I thought this one’s will opens the finitude of physicality and as long as there is will, the repetitive circular moves never have a recurrence. I planned a certain distance between two swings so that the two can barely touch each other when they get as high as possible at the same time. It was as if these all are built for ‘touch’ which would be the most immediate element in relationships. I am hoping to install the life size swings so that people actually can play on them, then I will learn more from the real happening as to how I can go further.